When you picture foods from the Mediterranean, you might imagine colorful fruits and vegetables, hearty breads, pasta, fish and, of course, red wine. But did you know that the Mediterranean style of eating is one of the healthiest, if not the healthiest, in the world? 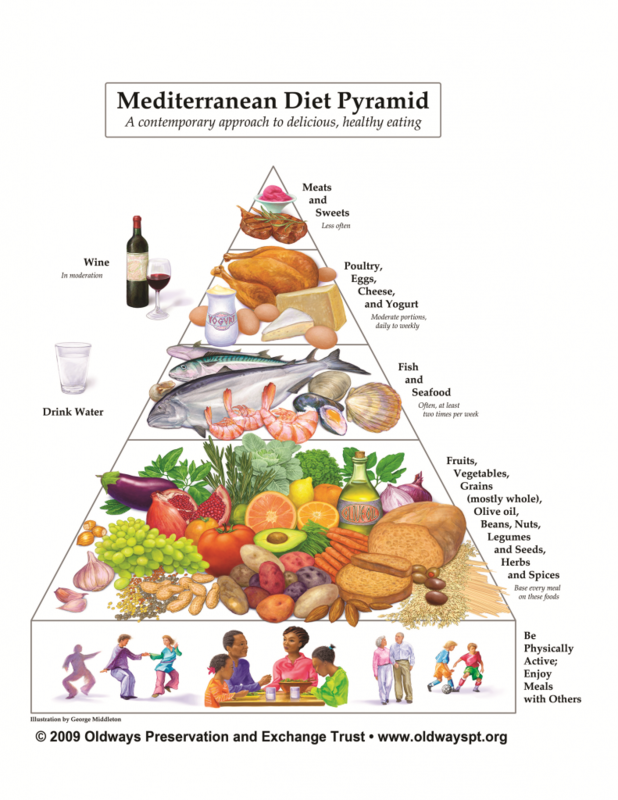 While the Mediterranean diet is not new, it is gaining popularity in the United States. U.S. Dietary Guidelines released in 2015 recommend a Mediterranean style of eating. Incorporating more Mediterranean-style foods can improve the nutritional profile of the gluten-free diet, while providing other health benefits to manage or prevent chronic diseases such as heart disease and diabetes. Keep in mind that physical activity is part of the Mediterranean way of life too. Ancel Keys, Ph.D., was the first researcher to promote the Mediterranean style of eating, following the Seven Countries Study conducted shortly after World War II. The study examined the eating habits of almost 13,000 men in different areas of the world. Keys and his colleagues found that people who lived in areas such as the Mediterranean, where it was common to eat a diet high in fruits, vegetables, fish, grains, beans, herbs, spices and healthy fats, had better cardiovascular health than those in the United States. Since then the Mediterranean diet has been proven to offer many health benefits, particularly in the areas of heart disease and diabetes. A 2015 study from Harokopio University in Greece showed that a Mediterranean-style diet can reduce the risk of heart disease by 50 percent, an effect even more protective than exercise. There is some evidence that metabolic syndrome, a precursor to diabetes and heart disease, can be reversed by the Mediterranean diet. A 2015 analysis of nine studies that involved nearly 1,200 patients found that people with Type 2 diabetes who ate a Mediterranean-style diet had improved blood sugar control, better cholesterol and triglyceride levels, better control of blood pressure, and improvements in weight. A 2014 Italian study found that the Mediterranean diet can slow the progression of diabetes, and yet another study showed a reduction in the development of diabetes-related eye disease. But the benefits don’t end there. Additional studies have shown the Mediterranean diet improves cognitive function, eye health, sleep apnea and weight-to-body-mass index. The diet also reduces the risk of developing Alzheimer’s disease and inflammation in the body and helps prevent cancer. The Mediterranean diet emphasizes whole grains, fruits, vegetables and healthy fat, but fish and seafood are eaten frequently, with poultry, eggs and cheese allowed in smaller amounts. Red meat and sweets are meant to be treats and aren’t eaten regularly. Red wine is allowed in moderation—one five-ounce drink for women and two for men—along with plenty of water. Daily exercises, both strenuous and light, are important additions. And the diet encourages the social experience of eating shared meals. The health benefits of the Mediterranean diet extend to those with celiac disease. “A Mediterranean diet is a great way to supply some of the nutrients that a standard gluten-free diet might otherwise be lacking,” says Kelly Toups, R.D., program manager for the Whole Grains Council and Oldways, a nonprofit food and nutrition education organization. A small study published in January 2016 in the European Journal of Clinical Nutrition found that those with celiac disease who followed gluten-free and Mediterranean-style diets were able to improve their nutritional status without becoming overweight or obese. Weight gain can be an unwelcome consequence of following the gluten-free diet, but adoption of a Mediterranean diet can counter this side effect. A 2011 study in the American Journal of Medicine showed that those on the Mediterranean diet lost more weight than those on a traditional low-fat diet. And a 2010 study published in the American Journal of Clinical Nutrition showed that the diet reduces weight gain thought to be related to aging. Toups advises patients looking to lose weight to base their meals on the Mediterranean diet pyramid, making vegetables, whole grains and pulses including peas, lentils and chickpeas the basis for each recipe. Olive oil should be used as the primary fat, and fruits, nuts and fish added for flavor. “There is no need to count calories or grams of different nutrients if the diet is based on filling, nutrient-dense foods,” she says. In addition, the Mediterranean diet may have benefits for those with anemia, a common problem for those newly diagnosed with celiac disease. A 2009 study in the International Journal of Food Sciences and Nutrition found that adolescent boys who switched from a regular diet to a Mediterranean diet had increased absorption and retention of iron, even though the amount of iron in their diet did not increase. C sources, such as tomatoes or red peppers. recommended daily value for iron. Whole grains play a big role in the Mediterranean diet, and though they are usually wheat based, it’s easy to substitute gluten-free choices. In general those on the gluten-free diet have trouble getting the recommended amounts of whole grains. A 2005 study by Tricia Thompson, R.D., showed that nearly 37 percent of men and 79 percent of women had this problem. While more gluten-free products are now made with whole grains, many products still rely heavily on rice flour. And gluten-free consumers are just beginning to work whole grains into their diet plans. Toups recommends polenta made from whole-grain cornmeal. “It was a staple in Italian and Greek Mediterranean traditions and is the perfect vessel for any assortment of legumes or seasonal vegetables,” she says. 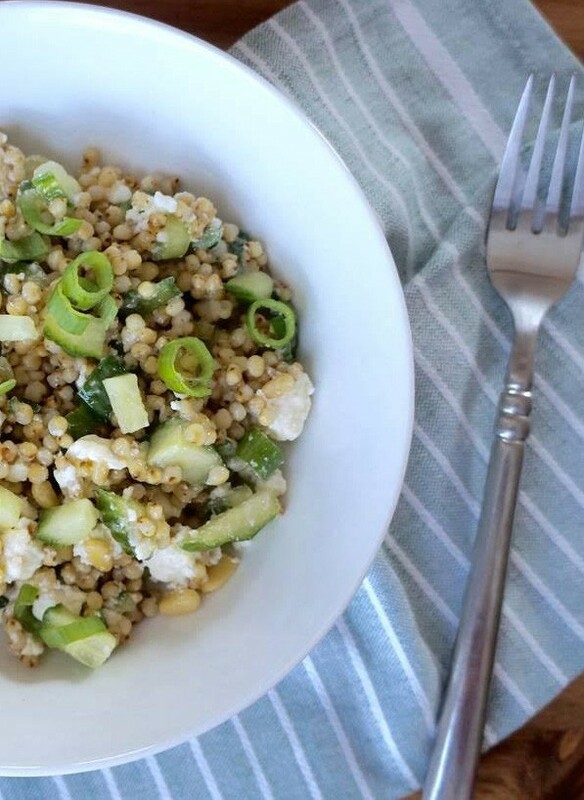 You can also toss quinoa with tomatoes, olive oil, lemon juice and parsley for a gluten-free twist on the classic tabbouleh salad. Toups also recommends using whole-grain gluten-free breads and crackers for spreads such as hummus and utilizing gluten-free whole-grain pasta for a quick weeknight meal. “Gluten-free steel-cut oats are my favorite secret weapon for making creamy, whole-grain risotto, although parboiled brown rice makes a suitable stand-in,” Toups notes. A gluten-free label on grain products is assurance that they meet the Food and Drug Administration standard for gluten-free food. come from monounsaturated fats—due largely to the extensive use of olive oil. For a light flavor for salads or vegetables, select extra-virgin olive oil. For frying and roasting, virgin olive oil works well. When purchasing olive oil, look for the bottling date and avoid any that is more than 18 months old. Additionally look for the words “cold pressed” because cold pressing oils keeps all of the health benefits and preserves flavor. Olive oil should be stored in a dark, cool place at home. Olive oil can be used to toss gluten-free pasta, sauté vegetables or cook scrambled eggs. 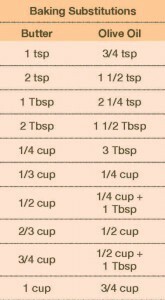 Add it to popcorn in place of butter and use it to marinate poultry or fish and as a dip for gluten-free breads. Olive oil can also be used instead of butter in gluten-free baking. Adding another diet on top of the gluten-free diet may seem complicated, but it’s actually quite easy. Both use naturally gluten-free foods as building blocks. veggie burgers with lentils, quinoa, gluten-free oats and spices. Use whole-grain gluten-free pasta to make traditional spaghetti or baked ziti. Leftovers are great for a quick lunch the next day. Canned salmon can be made into fish cakes by combining it with onions, egg, salt and pepper. 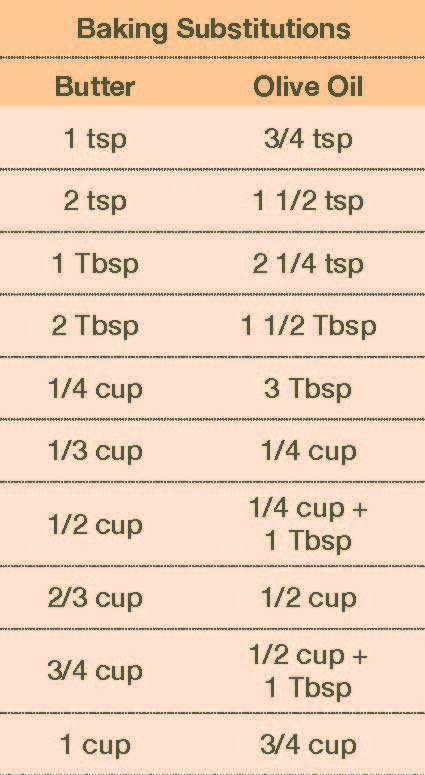 Hold the mixture together with mashed potatoes or gluten-free panko crumbs. Avocados are a versatile Mediterranean “superfood” full of healthy fats. Spread mashed avocado on a slice of gluten-free whole-grain toast or add diced avocado to omelets, vegetable salads or fruit salad made with berries, apples and mango. You can also slice avocados and layer them on sandwiches or in wraps. Hummus, which is made from chickpeas, makes a great substitute for mayonnaise on sandwiches and in tuna and chicken salad or deviled eggs. It also works as a dip for vegetables instead of more fattening ranch dressing. Spread hummus on a gluten-free tortilla or bagel. To make a healthier pizza, top gluten-free crust with hummus, add vegetables and olives, and top with feta before baking. Serve hummus with gluten-free whole-grain crackers for a quick snack. Greek yogurt is a good option for those who have lactose intolerance, as it is lower in lactose than other dairy products. Use it as a topping for vegetables or a bowl of gluten-free oatmeal finished with a layer of fruit. Substitute Greek yogurt for sour cream in dips or as a topping for baked potatoes. It also works in smoothies and can be topped with honey and walnuts for a delicious dessert. If you rethink your approach to snacks, you’ll soon find that healthy nuts and seeds are as quick and portable as the packaged products you’re used to eating. And they can easily be incorporated into recipes. smoothie with Greek yogurt, peanut butter, honey and walnuts. You’ll find more ideas on how to easily incorporate Mediterranean foods into your gluten-free diet on the Oldways website, oldwayspt.org. One of the joys of the Mediterranean diet is its emphasis on eating as a social activity. For those who are gluten free and often feel left out when others gather around the table, this part of the Mediterranean diet can be refreshing. “An important aspect of the Mediterranean diet is sharing food in the company of friends and family, savoring the social interaction as much as the delicious flavors,” Toups says. “The Mediterranean diet is about food from a simpler time, where unfussy mixed dishes brimming with seasonal vegetables were the norm. “Don’t overlook a nice soup and salad combo. Soups and stews were a very resourceful way for Mediterranean families to incorporate local or leftover produce into healthy, hearty meals.” Toups also encourages people with celiac disease to select gluten-free pasta when it’s available at a restaurant. Ask to have it topped with olive oil, tomato sauce, veggies, or seafood and fresh herbs. Research shows making even the smallest steps toward a Mediterranean-style diet can lead to benefits. A recent study presented at the American College of Cardiology showed that every one point increase on a Mediterranean diet score—which measured how closely those in the study followed the diet—was associated with a 3 percent drop in the risk of heart disease. If it seems overwhelming to make a wholesale change, try one step toward the Mediterranean diet every week. For example start by using olive oil for cooking instead of vegetable oil. Then add more beans and nuts over the next few weeks. Since these foods contain more fiber, be sure to drink more water to avoid constipation. The Mediterranean diet can help relieve the culinary boredom some people feel on the gluten-free diet because it includes such a wide variety of foods prepared in simple but flavorful ways. Before long you’ll be enjoying your food more and feeling better than ever at the same time you are improving the nutritional quality of your diet. room temperature, fluffing with a fork occasionally. nuts, feta cheese, red pepper and salt. Add the cooked sorghum and mix.